Dilon 2000: Compact scintimammography gamma camera and imaging device, Dilon Technologies, Inc.
Each year in the U.S., 1.2 million women undergo biopsies to determine if suspicious findings in a mammogram may be breast cancer. With 900,00 of those biopsies negative, each patient still endures this invasive and traumatic surgical procedure that provides the most accurate means of cancer detection. Another method, called scintimammography, has been undergoing investigation for several years a s a possible complementary tool to X-ray mammography in breast cancer detection, to lessen or eliminate the need for biopsy. Compact scintimammography gamma cameras are new imaging devices being developed by the US Department of Energy's Thomas Jefferson National Accelerator Facility (Jefferson Lab) Physics Detector Group in collaboration with Johns Hopkins University, the University of Virginia, Hampton University, George Washington University, and Dilon Technologies, Inc. The compact cameras use scintimammography, a nuclear medicine method of breast tumor detection. It is hoped that scintimammography can be added to the arsenal of tools used to detect all cases of breast cancer. It can put additional information in the hands of clinicians and patients to decide when and how to perform biopsies. Scintimammography uses standard biological radiotracers (typically 99mTc-sestamibi) to locate a tumor. Up to now, scintimammography has been performed with standard full-sized clinical gamma cameras, usually over two feet in diameter. Their large size causes difficulty in positioning the camera near the breast, rendering the camera unsuitable for detecting small lesions. The main advantage of Jefferson Lab's detectors is the compact size of the device which allows imaging of small lesions. Dr. Brem believes that nuclear imaging will be incorporated into the clinical breast work-up, just as ultrasound is currently used. "With the improved resolution and the ability to image in positions similar to mammography, as well as the ability to localize and biopsy areas of increased focal uptake," Dr. Brem said, "it will be hard to envision a comprehensive breast center without this technology." New clinical trials are continuing at the George Washington Hospital where Dr. Rachel Brem is now the Director of the Breast Imaging and Intervention Center. This technology is patented by Jefferson Lab and is currently licensed by Dilon Technologies, which has received FDA authorization for its Dilon 6800 mobile gamma camera and is marketing its product. 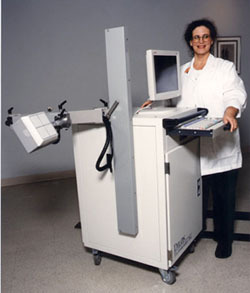 To facilitate research into the usefulness of scintimammography another similar breast imaging instrument was developed. This device, constructed by the Jefferson Lab/Hampton University partnership, is being used in clinical studies involving breast procedures at Riverside Hospital. This instrument can potentially reduce the number of unnecessary biopsies. The new "mini-gamma camera" built to view a small region of the breast was constructed to fit a commercial digital X-ray needle stereo biopsy system. The women included in this study were already scheduled for a breast biopsy because of suspicious regions identified on their mammograms. These volunteers are scheduled for a pre-op procedure one or two days prior to the actual biopsy operation. On the pre-op visit the patient is positioned on the stereo table, the breast is compressed and three digital X-ray views are obtained: a straight-on scout view and two stereo views (+/- 15 degrees). These views are taken to plan the actual biopsy procedure. The study-patients, while still under compression, are then injected with 25mCi (925 MBq) of 99mTc-sestamibi and imaged for 10 minutes. 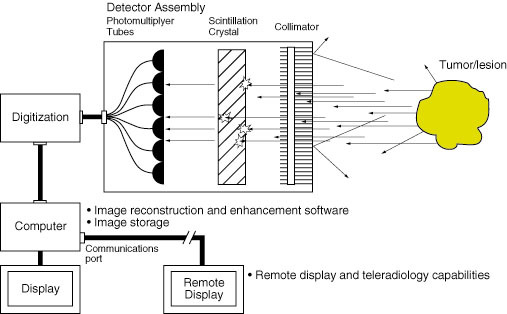 Using this device, researchers obtain a digital X-ray image from the commercial system overlay that image ("co-register") with the gamma-ray image obtained using the scintimammography mini-gamma camera. If the two images line up, the tumor is likely to be cancer. This device is being used as a research tool to test the effectiveness of scintimammography to identify whether lesions are cancerous. To date, about 30 patients have been imaged with the device. The Detector Group is also developing devices that are based on positron emission tomography (PET). The latest advanced breast imaging instrument developed with funding from the DOE's Office of Biological and Environmental Research in Office of Science and in collaboration with Duke University will use high sensitivity and a high resolution imaging technique to detect even smaller breast lesions.